The Sheffield weather was on its best behaviour as Graves Park, Sheffield hosted the North of England Cross Country Championships and the South Yorkshire Relay championships on Saturday. The runners found themselves on a firm and dry course, unusual conditions for cross country enthusiasts but a welcome change. 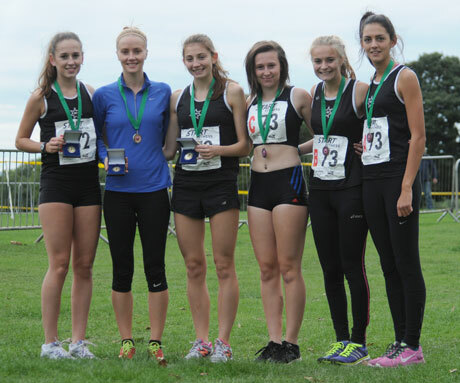 Rotherham Harriers had 20 teams running, an excellent turnout, and came away with one North of England title, 3 South Yorkshire championship gold medals, 1silver medal and 3 bronze medals. The star team was, once again the senior ladies team who came into the race defending champions and firm favourites for a medal. They did not disappoint as they raced away from a high class field to collect the South Yorkshire and North of England medals in fine form. Young Natasha Hatswell took responsibility for the first leg and held her own against the top athletes in the other teams with a time of 12:07 to hand over in a close 4th place to Steph Burns. Steph ran a blistering leg (11:53) to propel the Harriers into first place and hand over to Sam Johnson. Sam was almost as quick and there was never any doubt about the result as her 12:01 brought the team home in first place by 24 seconds from a fast finishing Holmfirth team and well over a minute clear of Stockport Harriers AC. The strength of the team can be seen by the fact that all three runners achieved times in the top 8 recorded all day by the 65 athletes competing. The senior men's team were determined not to be outshone by the ladies and recorded their best ever finish as they swept to victory in the South Yorkshire championships and took an agonising 4th place in the North of England race only 3 seconds behind Liverpool Harriers in Bronze medal position. Kyle Craib's first leg (10:37) was good enough for 12th place but young Luke Cotter (10:25) was the fastest Harriers athlete of the day as he cut through the field to put them into 6th place at the end of leg 2. Aidan Johnson's 10:44 was enough to maintain their position and give Richard Harris a chance of a first ever North of England medal. Richard ran the team's second fastest time (10:34) and passed the Sunderland AC athlete in front of him but just failed to pull back 16 seconds on the Liverpool last leg runner and the team thought they had finished 5th. The disqualification of Sale Harriers moved them up to 4th tantalisingly close to that first medal. The other winning team was the Under 15 Boy's squad who clinched the South Yorkshire championship by over 30 seconds from Hallamshire Harriers with a 5th place finish in the North of England Race. Joseph Massingham's first leg of 7:01 was good enough for 6th place and Kane Smith (7:15) pulled the team up into 3rd place with a chance of a medal. In a fiercely contested finish Declan Walker-Smith (7:32) was overhauled by Sale Harriers and Pendle AC and pushed down to 5th but stayed well clear of all the South Yorkshire rivals to bring home the gold medals for the team. The U13 Girls were South Yorkshire silver medallists as they worked their way through the field to finish 4th overall but some way behind the first 3 teams - with Hallamshire taking the local honours with 3rd place in the North of England Championships. Mya Taylor set the team off with their fastest leg (6:01) and handed over to Annabel Johnson in 9th place. Annabel's 6:18 took the team up 3 places to 6th and Grace Harris ran a strong last leg (6:05) to clinch the silver medals. The U11 boys brought home the first medal of the day as they took the bronze medal for 3rd best South Yorkshire team with 7th place overall. Ryan Viggars (5:16) put the team into 3rd place on leg one and Declan Mullane (5:37) held onto the place. With the teams very closely bunched Oliver Johnson (5:59) was unable to prevent several teams running their strongest athletes on the last leg passing him but held on to take the bronze medal. The second bronze medal of the day went to the U17 women's team with Charlotte Dodds (9:24) running the team's fastest leg for 15th place. Maisie Elliott(10:17) kept the team in 15th and Ruby Torry (10:41) improved to 14th place overall but, crucially, held onto 3rd place in the South Yorkshire Championships for a welcome medal. The final medal winning team was the Senior Ladies 'B' team who demonstrated the strength available to manager Nigel Brookes with a stunning 8th place overall in the North and the bronze medals for 3rd South Yorkshire team to finish. Mary Jenkinson (12:50) was 10th after leg 1, Emma Dutton (13:30) handed over to Jess Freeman in 11th and Jess (13:8) brought the team home in 8th and a second podium place for the Ladies squad in the same championships. Spare a thought for the veteran Mens O60 team who were unable to field a last leg runner.After Rob Tintinger (12:51) and Malc Palfreyman (14:35) had recorded the 1st and 3rd fastest legs on the day they were leading the race by well over a minute after the first two legs and had to watch in frustration as the medals were decided. The under 17 men fielded another competitive side but were beaten into a close 4th place in the South Yorkshire championships with 11th place overall. Devon Stead (7:29) was 9th, Daniel Bradford (7:54) slipped to 14th and Ryan Beale (7:52) pulled back to 11th. The U 13 Boys team were also a close 4th in South Yorkshire with 14th place overall. Matthew Stevens (5:49 was 13th, Bailey Stead (6:18) took the team into 11th and Darnell Joseph (6:37) brought them home just out of the medals. The veteran ladies (O35) were able to field a full team and they took 6th place overall and 3rd South Yorkshire team. Sharon Marshall (16:06) , Philippa James (14:50) and Gill Taylor (17:09) making up the team. The U 15 Boys B team (Alex Kitson 8:10, Joseph McNulty 8:29 and James Johnson 8:33) were 25th overall and 5th South Yorkshire team. The U 11 boys B team (Alex Bonnington 6:39, Nathan Pogmore 6:27, Miles James 8:04) were 13th overall and 6th South Yorkshire team. The U 13 Girls fielded three teams with theA team claiming silver but the B and C teams fighting it out all the way for bragging rights. In the finish the B team just prevailed over a spirited C team by 3 seconds with the teams in 5th and 6th places respectively in the South Yorkshire championship. B team - (Olivia Parkes 6:41, Mia Harris 6:53, Phillipa Hartley 6:48) C Team - ( Keiva Rennocks 6:40,Bronte Rennocks 6:47, Cyane Robinson 6:58). The U13 Boys B team (Jack Stokes 6:16, Ashley Pogmore 6:32, Howard Kniveton 6:46) were 20th overall and 6th South Yorkshire team. The U15 Girls A team ( Louise Oak 9:10, Sophie Oak 10:03, Kelsey Noble 11:03) were 7th South Yorkshire team and the B Team (Georgia Bradford 10:10, Ellie Guy 9:50, Darcey Joseph 12:04) were 8th South Yorkshire team. An incomplete senior Ladies C team (Natalie Raynor 13:37, Collette Bunker 14:21) were in 17th place overall after 2 legs and the Senior Men's B team ( Elliot Smales 11:08, Oliver Watson 11:57; Nigel Brookes 12:48, John Maxfield 12:22) was non-scoring as John was an undeclared runner. This was the best performances by the club at the Northern championships ever with the senior ladies champions and the senior men just missing a medal. With the number of younger athletes taking part it augurs well for the future of the club in the cross country competitions for which Harriers are justly well known.